As a HCS service provider you probably recognize the problem. People use the Cisco VoIP Extension Mobility feature but get tired of typing large numbers of digits on their telephone keypad, just to login. If you indeed do recognize the problem we would like to take 2 minutes of your time. Our Active Login Manager solves the problem and will differentiate your portfolio from default HCS offerings. One of the powerful features of Cisco Unified Communications is Extension Mobility. Using this feature users can register themselves on any Cisco telephone in the IP network and use it with their own settings and extension number. Nevertheless, using the feature is far from convenient. To use the Cisco Extension Mobility feature, you have to enter an – often long – username and PIN via your telephone keypad. Each time when you want to login. Every day and sometimes even many times a day. Systems Managers often come up with non-secure workarounds. Like a username that is similar to the extension number or a PIN that is 0000. By installing our Active Login Manager client on a user’s laptop, each time he (or she of course) starts his computer, the associated telephone at the desk is immediately and automatically loaded with his profile and settings. So, whenever someone enters a flex-desk, opens his laptop and logs into the network, he can immediately be reached via his own extension number. He can also use his own contact list, voicemail and other features. And as soon as the computer is logged off, the telephone is logged off as well. Just like that. Very user friendly and secure. It is for this reason that already thousands of companies worldwide deployed our software with their on-premise Cisco VoIP solution. A user-friendly and secure Single Sign-On solution for Extension Mobility users. The client is white-labeled and will be branded for your company. Optionally it can also be branded for individual customer organizations. No complex integration process. Your service can be up and running in a few hours. 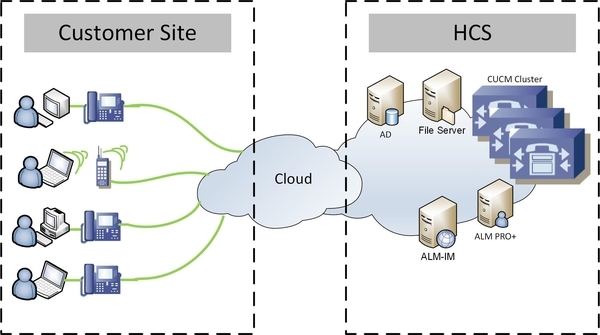 ALM works seamless with your CUCM servers and (optionally) customer’s Active Directory servers. Simple license, support and maintenance contract. Try the service yourself today. Here you can find our solution video and the free trial download, so you can experience the benefits yourself. More information about the ALM offering for HCS providers? If you want more information about our ALM solution or like to discuss the possibilities to integrate ALM into your HCS offering, please contact our sales & business development team via the contact page. We are happy to answer all your questions and discuss the potential benefits of a co-operation. Interested in ALM for HCS?